The only ore of chromium, the metal used to make stainless steel, nichrome, and chrome plating. Chromite is an oxide mineral composed of chromium, iron, and oxygen (FeCr2O4). It is dark gray to black in color with a metallic to submetallic luster and a high specific gravity. It occurs in basic and ultrabasic igneous rocks and in the metamorphic and sedimentary rocks that are produced when chromite-bearing rocks are altered by heat or weathering. Chromite can be challenging to identify. Several properties must be considered to differentiate it from other metallic ores. Hand specimen identification of chromite requires a consideration of: color, specific gravity, luster, and a characteristic brown streak. 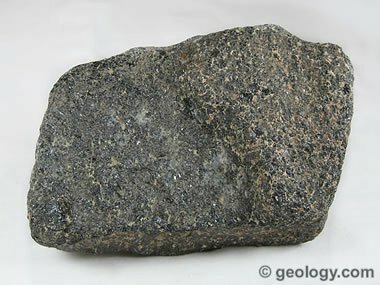 The most important clue to identifying chromite is its association with ultrabasic igneous rocks and metamorphic rocks such as serpentinite. Chromite is sometimes slightly magnetic. This can cause it to be confused with magnetite. Chromite and ilmenite have very similar properties. 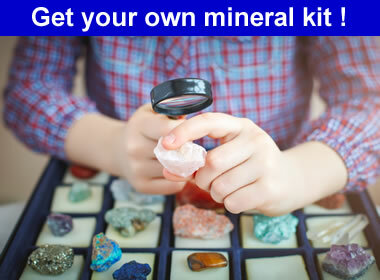 Careful observations of hardness, streak, and specific gravity are required to distinguish these minerals in hand specimens. Did You Know? The color of many gemstones is derived from trace amounts of chromium. The red color of rubies, the pink of some sapphires, and the green color of emeralds are derived from chromium. Image copyright iStockphoto / ProArtWork. Magnesium frequently substitutes for iron in chromite. A solid solution series exists between the mineral chromite (FeCr2O4) and the isomorphous mineral magnesiochromite (MgCr2O4). Intermediate specimens can be rich in iron ((Fe,Mg)Cr2O4) or magnesium ((Mg,Fe)Cr2O4). For convenience in communication, these minerals are often referred to collectively as "chromite." Some mineralogists give a generalized chemical composition of (Mg,Fe)(Cr,Al)2O4 for chromite. This composition recognizes multiple solid solution paths between chromite and hercynite (FeAl2O4), spinel (MgAl2O4), magnesiochromite (MgCr2O4), magnetite (Fe3O4), and magnesioferrite (MgFe2O4). Because of the many different compositions in these solid solution series, geologists and metallurgists often consider "chromite" to be any member of the solid solution series that has a significant Cr2O3 content. Bushveld stratiform chromite deposit: A field photo of the Bushveld LG6 chromite seam. This clearly shows the stratiform nature of the deposit. USGS photo by Klaus Schulz. 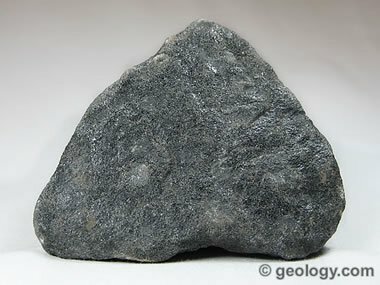 Small amounts of chromite are found in many types of rock. 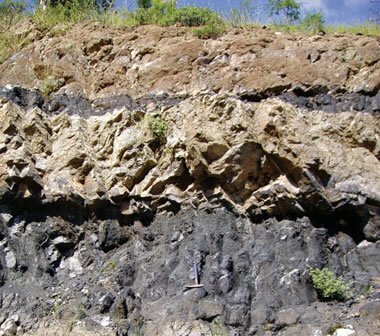 However, chromite deposits that are large enough for mining are generally found in: 1) stratiform deposits (large masses of igneous rock such as norite or peridotite that slowly crystallized from subsurface magma); 2) podiform deposits (serpentines and other metamorphic rocks derived from the alteration of norite and peridotite); and, 3) beach sands (derived from the weathering of chromite-bearing rocks). Chromite from South Africa: Chromite from the Transvaal area of South Africa. This specimen is approximately 3.5 inches (9 centimeters) across. Stratiform deposits are large masses of igneous rock that cooled very slowly in subsurface magma chambers. During this slow cooling, chromite and associated minerals crystallized early while the magma was still at a very high temperature. Their crystals then settled to the bottom of the magma chamber to form a layered deposit. Some of the layers in these deposits can contain 50% or more chromite on the basis of weight. Most of the world's known chromite occurs in two stratiform deposits: the Bushveld Complex in South Africa and the Great Dyke in Zimbabwe. Other important stratiform deposits include: the Stillwater Complex in Montana, the Kemi Complex of Finland, the Orissa Complex of India, the Goias in Brazil, the Mashaba Complex of Zimbabwe and small deposits in Madagascar. Nearly all of these are Precambrian in age. Chromite from Zimbabwe: Chromite from Shurugwi, Zimbabwe. Specimen is approximately 4 inches (10 centimeters) across. Podiform deposits are large slabs of oceanic lithosphere that have been thrust up onto a continental plate. These slabs of rock, also known as "ophiolites," can contain significant amounts of chromite. In these deposits the chromite is disseminated through the rock and not highly concentrated in easy-to-mine layers. Podiform deposits are known in Kazakhstan, Russia, the Philippines, Zimbabwe, Cyprus, and Greece. 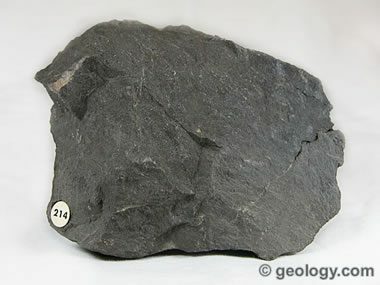 The first discoveries of podiform chromite deposits were made near Baltimore, Maryland in the early 1800s. These deposits supplied nearly all of the world's chromite until about 1850. These deposits were small and are no longer in production. Two facts allow these chromite sands to occasionally contain economic deposits of chromite. First, chromite is one of the more weathering-resistant minerals of peridotite. That causes it to be concentrated in residual soils that form in the weathering zone above chromite-rich rocks. Second, chromite has a higher specific gravity than other minerals in peridotite. This causes it to be selectively transported and deposited by wave and current actions, concentrating it in certain locations at streams and beaches. These deposits are sometimes rich enough and large enough that they can be mined for chromite. Did You Know? School buses and yellow lines on highways are often painted with "chrome yellow" paint. The "chrome" means chromium was used as an ingredient. Image copyright iStockphoto / 2windspa. Chromium is a metal used to induce hardness, toughness, and chemical resistance in steel. The alloy produced is known as "stainless steel." When alloyed with iron and nickel, it produces an alloy known as "nichrome" which is resistant to high temperatures and used to make heating units, ovens, and other appliances. Thin coatings of chromium alloys are used as platings on auto parts, appliances, and other products. These are given the name "chrome plated." It is also used to make superalloys that can perform well in the hot, corrosive, and high-stress environment of jet engines. Chromium's name comes from the Greek word "chroma" which means "color." Chromium is used as a pigment in paint. The familiar yellow lines painted down the center of highways and the yellow paint used on school buses are often "chrome yellow" - a color produced from chromium pigment. Chromium is an important pigment in many types of paint, ink, dye, and cosmetics. Trace amounts of chromium produce the color in many minerals and gemstones. The red color of ruby, the pink of some sapphires, and the green color of emerald are caused by tiny amounts of chromium. Chromium is not mined in the United States. The chromium consumed by United States industry comes from: A) other countries in the form of chromite ore, ferrochromium or chromium metal; or, B) chromium recovered from recycled metals. Over half of the chromium used in the United States today is from recycling. Because chromium is essential for the defense and prosperity of the United States, the federal government maintains a stockpile of chromite ore, ferrochromium, and chromium metal for use in a national emergency. This type of emergency could occur if the United States was involved in a war and the enemy prevented the delivery of chromite and chromium products by sea transport. In addition, small chromite deposits have been located in the United States which could be mined if they are needed. Stratiform Chromite Deposit Model: Ruth F. Schulte, Ryan D. Taylor, Nadine M. Piatak, and Robert R. Seal II; Chapter E of Mineral Deposit Model for Resource Assessment; Scientific Investigations Report 2010-5070-E; 131 pages; November 2012. Chromium: John F. Papp, United States Geological Survey, Mineral Commodity Summaries, January 2013. Chromium: John F. Papp, United States Geological Survey, 2011 Minerals Yearbook, April 2013. Chromium Makes Stainless Steel Stainless: S. J. Kropschot and Jeff Doebrich, United States Geological Survey, Fact Sheet 2010-3089, September 2010. How a Rogue Geologist Discovered a Diamond Trove in the Canadian Arctic: Carl Hoffman, Wired Magazine, Issue 16.12, last accessed June 2016. Kimberlite, the type of rock that holds many of the world's most important diamond deposits, usually contains small amounts of chromite, ilmenite, and certain types of garnet. Although these minerals occur in very small amounts, they are much more common in the rock than diamonds. Because these minerals do not occur together in most other types of rocks, they can be a valuable indicator of a nearby kimberlite body if they are found in stream sediments, glacial tills, residual soils, core samples, or well cuttings. Some of the greatest diamond deposits on Earth were discovered using the geology of indicator minerals.